Each September, my mom and I swap a cigar box full of goodness with each other. Sadly this is only our second year to do this. We should have started YEARS ago! The story behind the new tradition and our first boxes can be found here. I jokingly told someone on Instagram, we have spring birthdays and this ties us over until Christmas, but that does pretty much sum it up. My favorite part of the September box is watching my mom open it and look at each layer and item with care. She oohs and aahs. My second is putting it together. I love seeing how all the things I’ve been collecting go together and fit in. 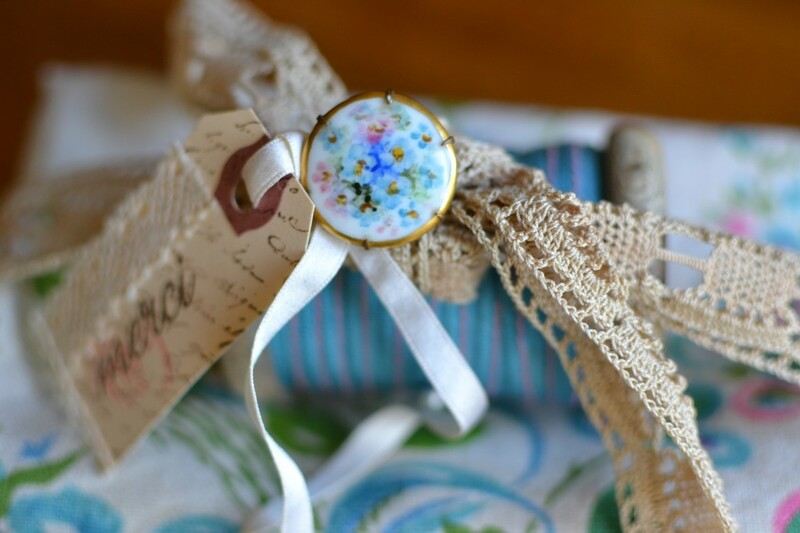 I like to embellish with ribbons, pins, lace and envelopes of vellum. I collected things all summer. Whatever doesn’t fit, gets saved for Christmas or another special occasion, or gets wrapped up nicely and put on top of the box! 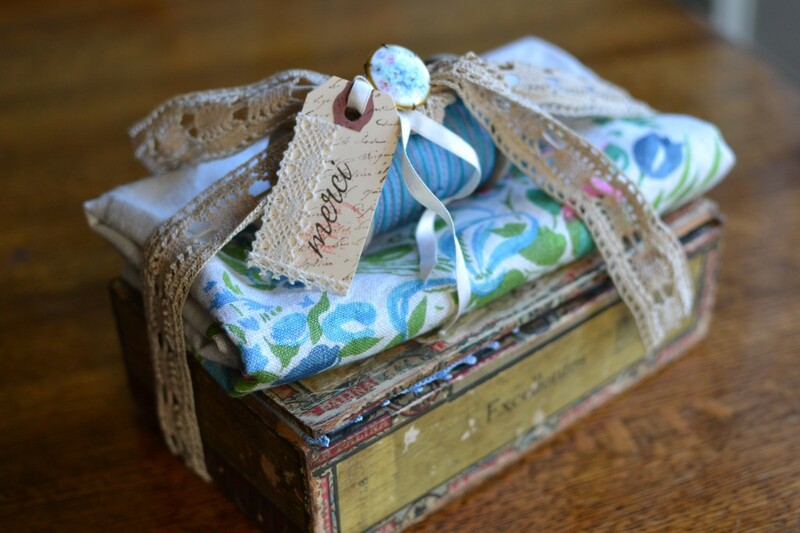 I found a beautiful vintage floral runner and I used it to be the theme of her box and matched all her items to it. I folded it and placed it on top along with a spool of ribbon to match. When I got to my parent’s house my mom had my box sitting on the dining room table and it looked beautiful! 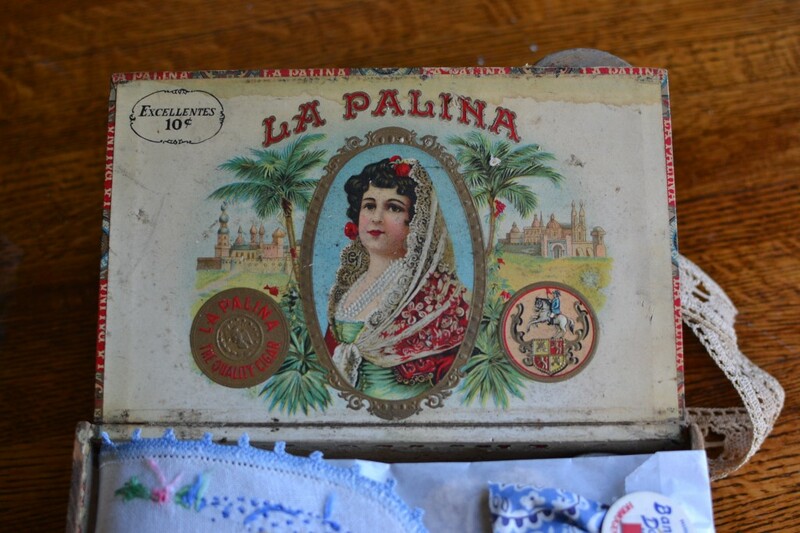 Not just a pretty cigar box. 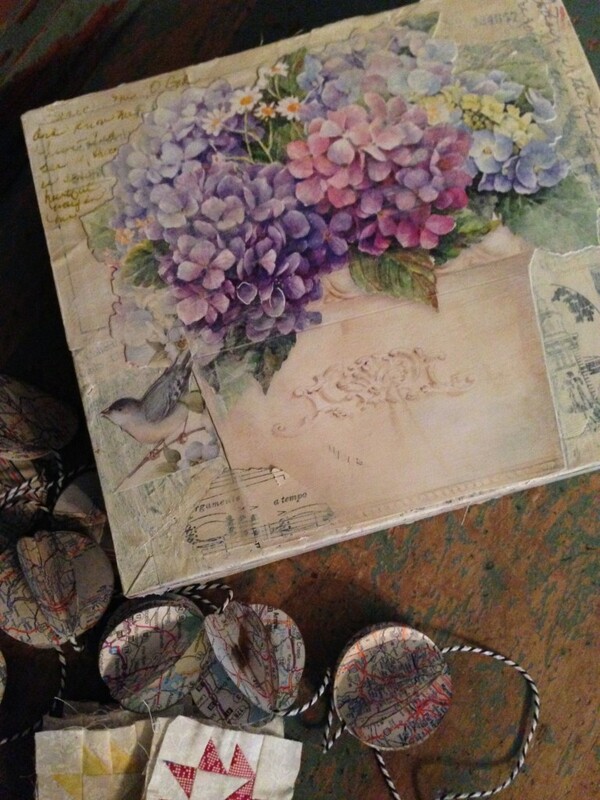 She had covered my box in vintage papers, painted it and gave it a beautiful texture and added a hydrangea print. She lined the inside with fabric selvages. 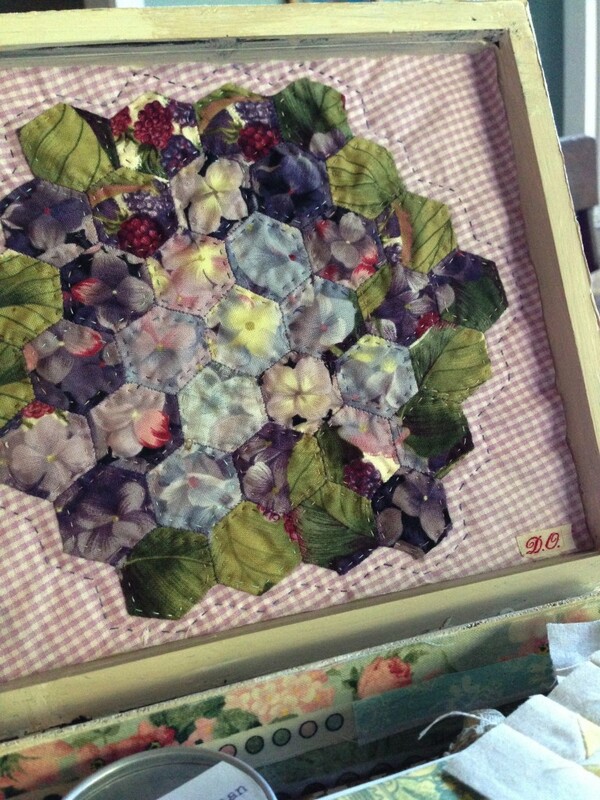 When I opened the box the lid was lined with a fabulous hydrangea quilt!!! Beautiful. 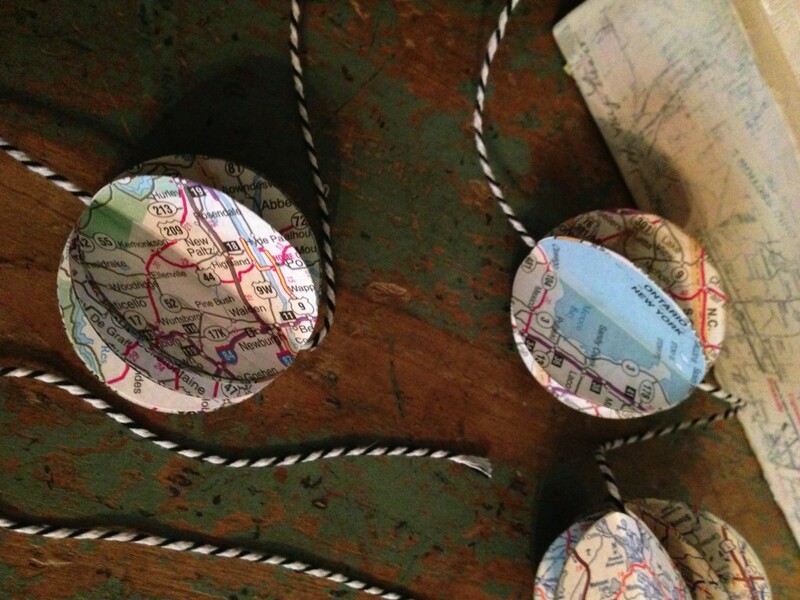 She made me a garland out of vintage maps with black and white cording. It’s so great! I love old maps AND garland. 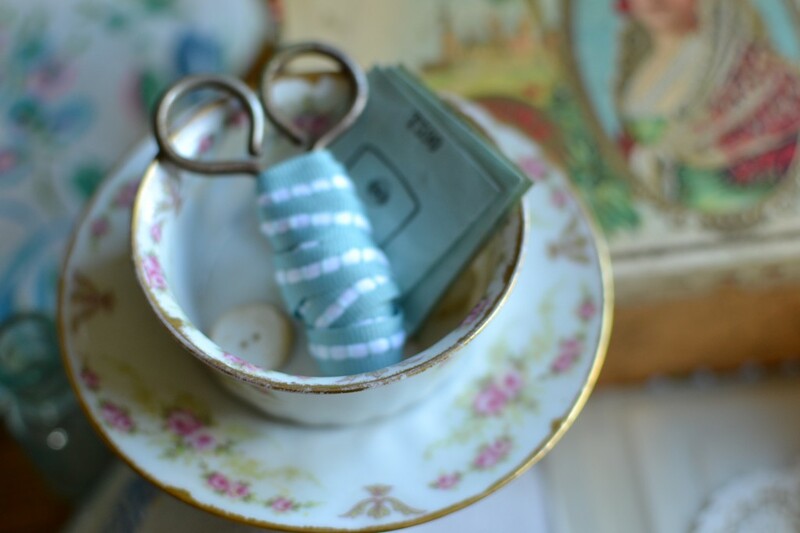 Inside was a little tin full of tiny little squares of quilt blocks! I admired hers hanging in her sewing room window and she made me my very own! So very special. 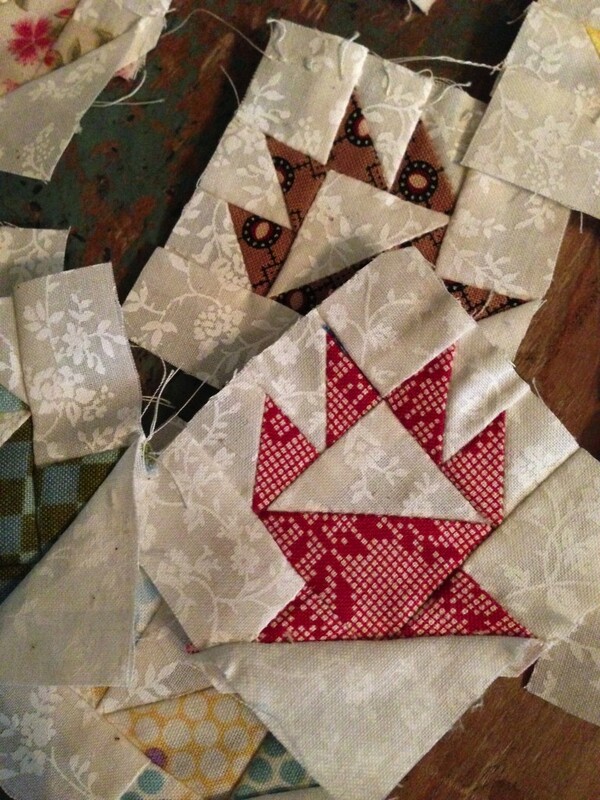 These are 2 inch squares. 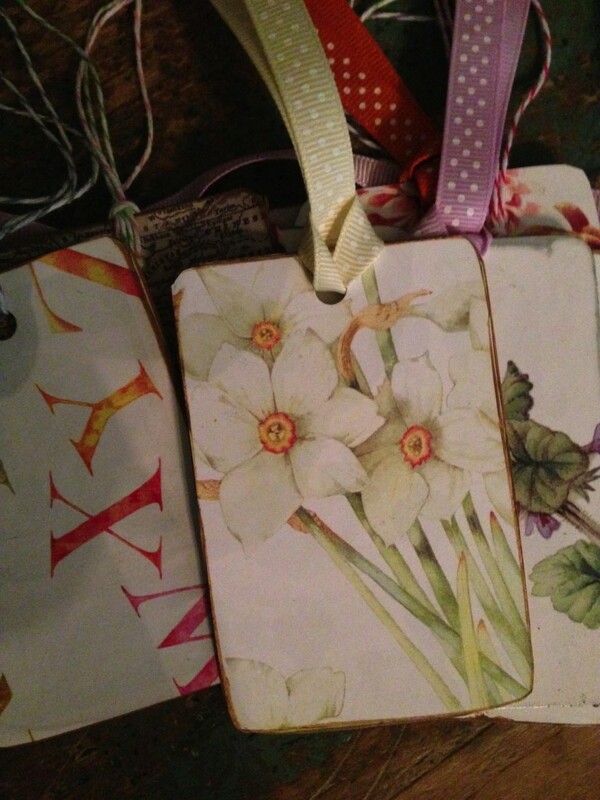 She made me gift tags using playing cards and glued or sewed papers on and tied ribbons. They are precious. 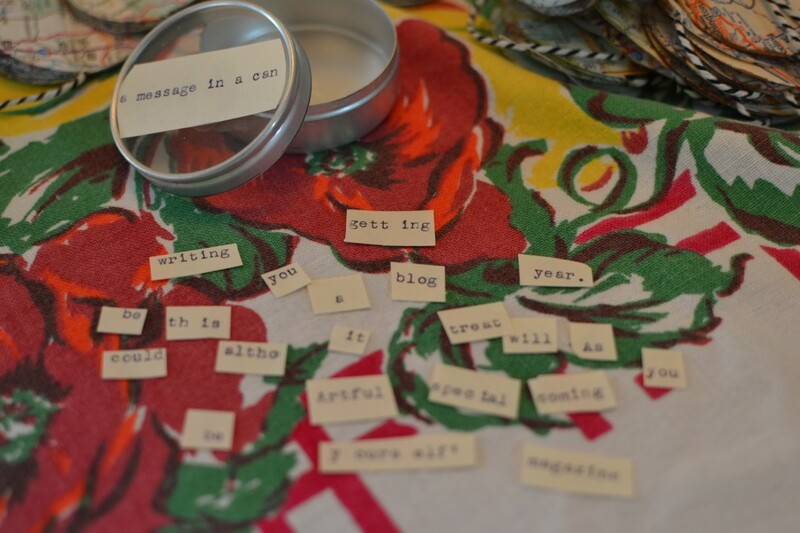 There was a little tin that said “a message in a can” full of little slips of paper with words typed on them. I pulled them out and tried to guess the message. 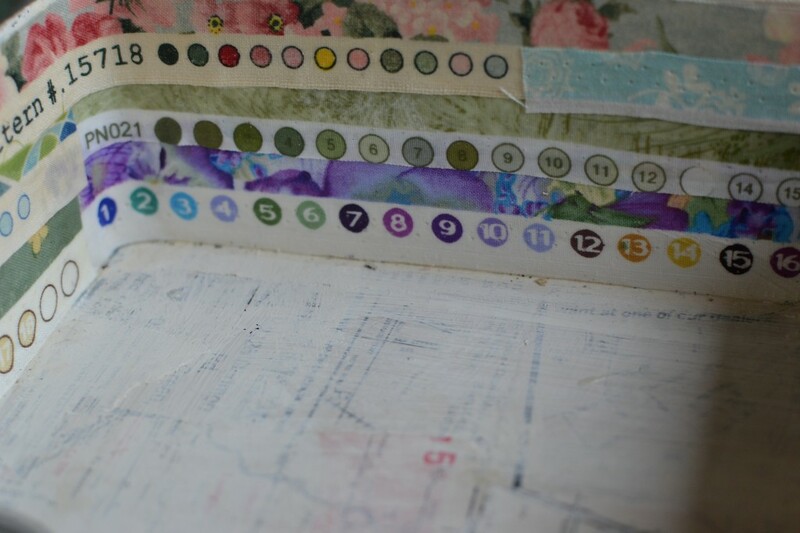 It was a years subscription to Artful Blogging!! Such a great gift and so very clever. 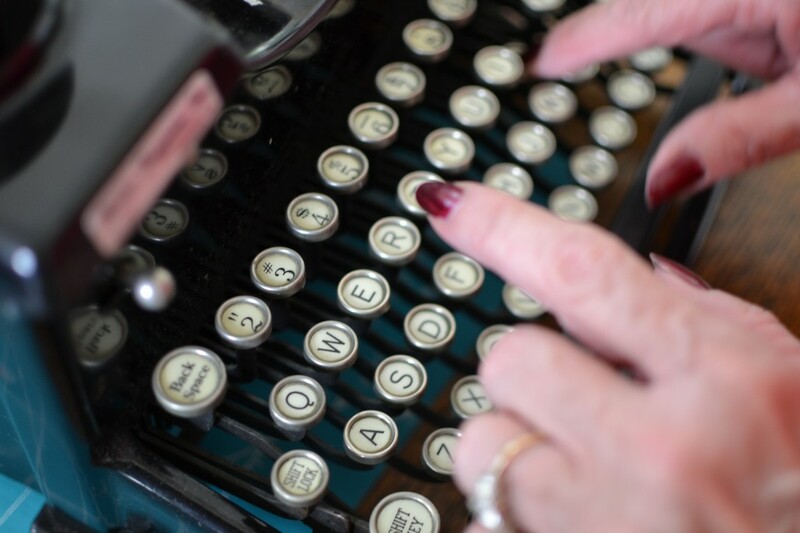 My Mom and her new typewriter. There is no stopping her! 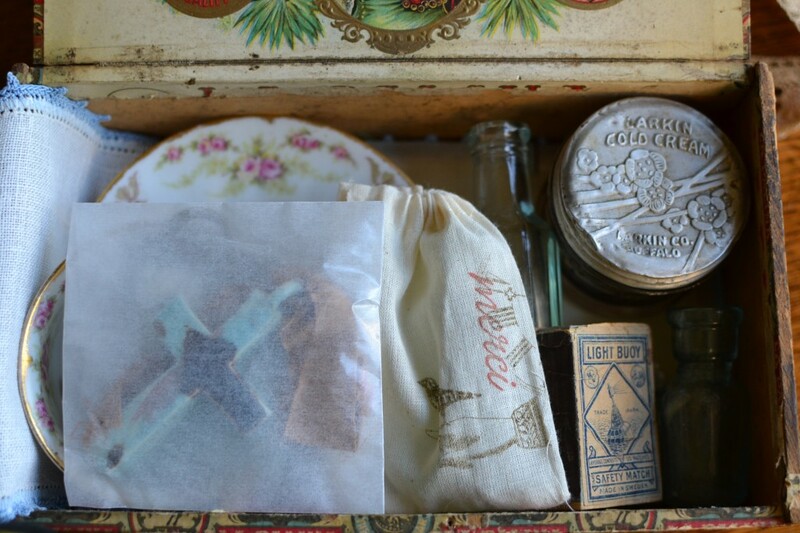 I received a September box full of treasures made from the hands of my mom. 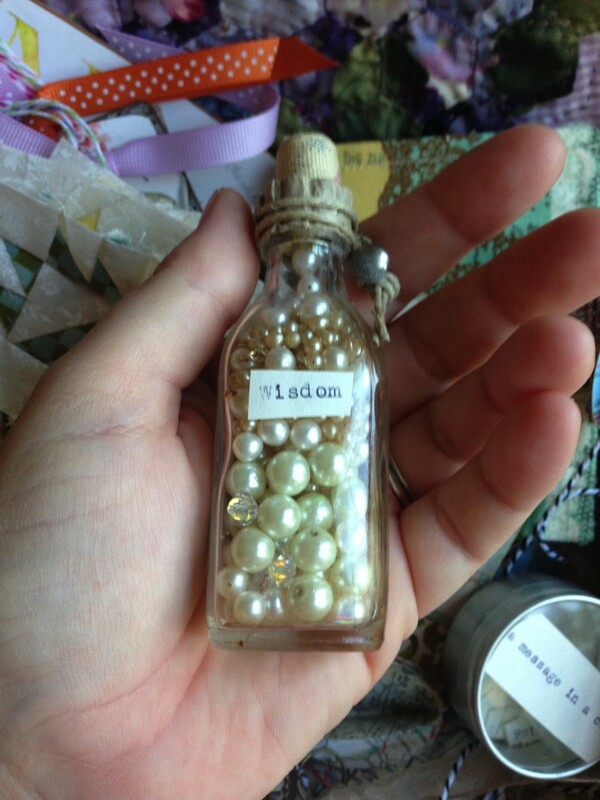 Everything made so special with care but the pearls of wisdom circle my thoughts around. It’s been years that I’ve considered her a friend and not just my mom. And at least that many that I considered you wise! I’m blessed on both accounts. 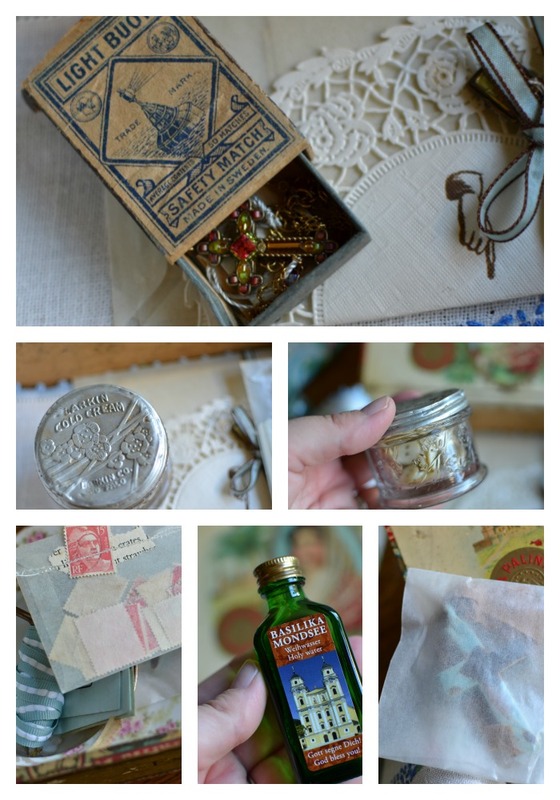 This entry was posted in mixed media, photography, vintage and tagged boxes, family, mom, quilts, september box, vintage by Katey. Bookmark the permalink. Katey this was so touching, what a lucky girl to have such a beautiful relationship with your mother. What a nice way to think about each other all year as you collect items for your boxes. What a wonderful tribute to treasures — your mother/daughter relationship & all it means to you both. – the greatest of all! A blessing, indeed. Thanks for sharing them. Your post has been a nice way to start my day. Love the call I got this morning from my number one fan!! Thanks mom! Many daughters and Mothers have wished to have this type of relationship, but it was not to be regardless of how much they tried . Yours is truly a God send full of the treasure of life. Praise Him!!! Nina, we miss you! Looking forward to being together soon! That Dian!! Love you. Dearest borh of you. This story has really touched me. What a lovely tradition. 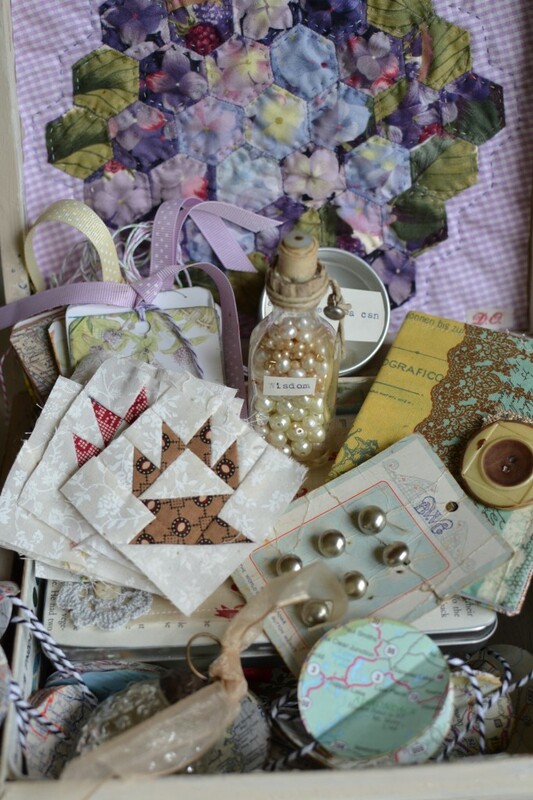 I relished every photograph, especially rhe collaged cigar box by Mom. I think I’ll start a similar tradition with my daughter as we have that kind of relationship. Thank you both for sharing this bond. Thank you Constanza. I know because you create with your hands that you would love to make a box to exchange with your daughter. Bless you both especially on your travels together. What a wonderful idea! thanks for sharing, Katey & Mom. Such sweet things. Thank you. I am glad you enjoyed it. I’m already looking forward to next year. Oh, Katey, how wonderful! 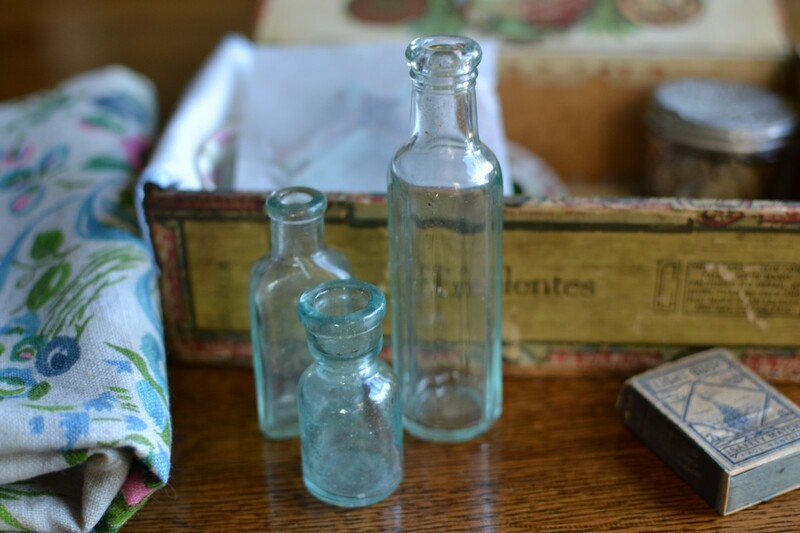 I have seen the pleasure Dian gets from carefully collecting little treasures for you all during the year, and the joy she gets from opening the very special things you have thoughtfully and loving selected for her. I envy your relationship–how wonderful for a mother and daughter to enjoy so many of the same things, and who almost know each other’s mind! You are so fortunate to have such a loving, generous mom, and she is so blessed to have a daughter like you! And I am blessed to have two such beautiful and creative friends! This is my first comment, what a lovely post! It is a beautiful thing to have your mother as your friend, how sweet and thoughtful to share such gifts with each other! What a lovely tradition! Those treasures are just beautiful and you obviously have a wonderful relationship with your mother. How wonderful for you both! Thank you. We do have a wonderful friendship. So blessed.